Start Aboard Train #025 - Smena (St. Petersburg to Moscow) . . . . Weather: Overcast, cool and breezy. Cold at night. We had to get up early this morning due to the early morning arrival time of the train. We were supposed to arrive shortly before 7 AM, so we are up at around 6:30 changing and getting our stuff ready for our arrival into Moscow. The train arrives on time at the Leningradskiy train station and this marks the end of our trans-Siberian and Mongolian journey by train. So, for the last time (at least for a while), we maneuver our bags out of our compartment into the narrow hallway, down the corridor past the samovar and provodnitsa's compartment and the toilet and out to the carriage door and onto the platform. The station is very busy with lots of people coming and going and just standing around. There are plenty of people trying to sell either a ride or a place to stay. In particular there are the elderly ladies who want you to come and stay at their apartments so they can supplement their meager pensions, eroded over time through inflation and the depreciation of the Rouble. We decide to be adventurous and take the metro to our hotel, which is very near one of the stations served by one of the metro lines that pass by this train station. In the station there are some signs that indicate the initial direction to the metro station, but once we have moved beyond these signs, they seem to disappear and we have to find our own we. After a bit of searching here and there outside the train station while fending off the many touts trying to get us to take a taxi (they say it will take hours to get their by metro - yeah, right), we find the metro entrance. Now comes the fun part - buy a ticket. There must be over 20 ticket windows in operation, but the lines are still massive. Well, we have time, so we join the queue and after about 10 minutes we get to buy our tickets - about 20 cents each. We have pretty much sorted out how to use the metro and read the signs, but we spend some time double checking to make sure we do not head down the wrong set of escalators and take the wrong train. As we are checking our guide books and the signs, a scruffy metro worked comes up to us and asks if he can help. We say that we are doing OK and that we know where we are going. He persists and we tell him which train we are taking and he confirms that we have the right set of escalators. We thank him and he then asks us for money. He gets very stroppy when we do not offer him anything, but if he is going to offer help with the expectation of getting paid, he better not expect anything from us. We do not want to encourage such behavior. We take the long escalator down to the platform and soon find which direction we want to go in. The trains run very frequently (like one every minute), so it is no rush to get on one. We find a car that is not over stuffed and clamber on with our bags. We have just a few stops to go and we get off at the Lubyanka station. Now to find the right exit from the station - there must be over half-a-dozen ways for us to choose from. And the metro staff are not much of a help. We name and point out the street we want to go to and it feels like we are trying to get to an address in New York. They seem to have no clue where it is. We follow the signs as best as we can and when we emerge from our exit we are delighted to discover that we have come up at the ideal spot with the shortest walk. After a walk of about one block, we arrive at the entrance to the Ararat Park Hyatt Hotel at a quarter to eight, less than an hour after our train pulled into the station. 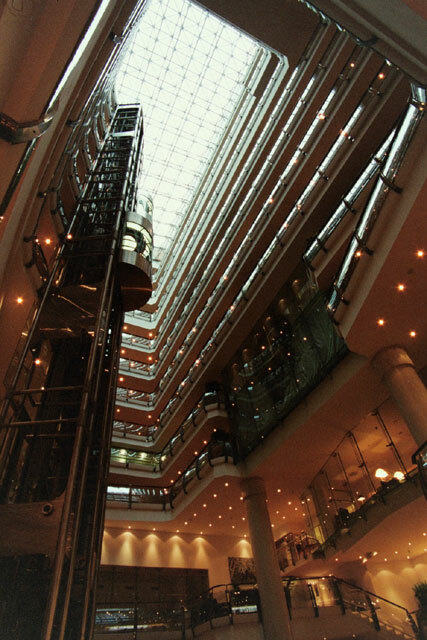 We have decided to use some of our accumulated points and stay free in a bit of luxury on our last stop on this trip. Well, the bell staff must not have been expecting such scruffy people to come to their fancy hotel, so it was only when we were already in the lobby that they offered to help. Then the check-in - how awful. We were treated just like, or even worse than, we had been treated at the cheapo hotels we had stayed at in Siberia and other parts of Russia. Must not have liked our overlanding appearance. Well, in the end we got our room and later in the day a nice apology from the manager for the poor service. After that, we had an excellent stay and the staff were very friendly and helpful. Once we had settled into our room, had a shower and put away our stuff, we decided to have a short nap before heading out. Well, our short nap extends to two ours and we do not leave the hotel until 12:30. And we are famished, so time to find a place to eat. We are lucky and find a Russian restaurant right on the corner. It is packed with locals, so we feel it is a good bet. After a very good and nourishing meal, we begin our exploration of the city. First stop is the nearby Bolshoy Theater and the ticket office. We discover that an Russian opera will be the performance the following night, so we decide to see that. Without to much trouble and with the help of a kind gentleman, we are able to purchase some tickets. We are not quite sure where they are located in the theater, but the price seems reasonable, so we grab them. 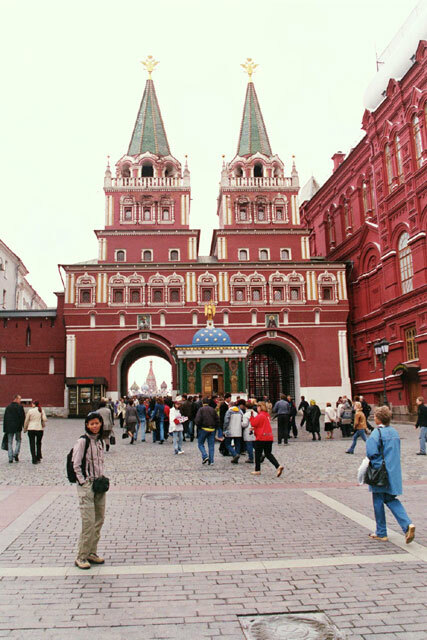 Then it is off to Red Square. We enter through the Resurrection Gate and then - what a big disappointment - the whole square is closed off. We cannot get into it to walk and look around. We have heard that it has been closed for most of the summer - lots of special events. This seems awful - close off the main city square so that a few select people can use it and everyone else has to look from afar. Well, we decide to check out St. 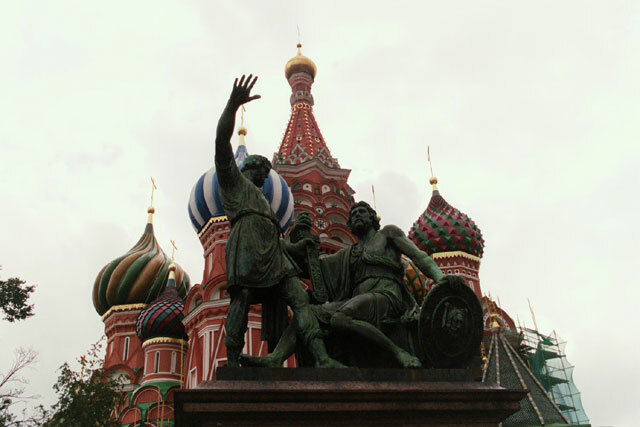 Basil's Cathedral, so we walk around GUM and to the other side of Red Square and pay our admissions to the church. We spend some time wandering around the interior, which is a warren of corridors and narrow steps that lead from one chapel to another. 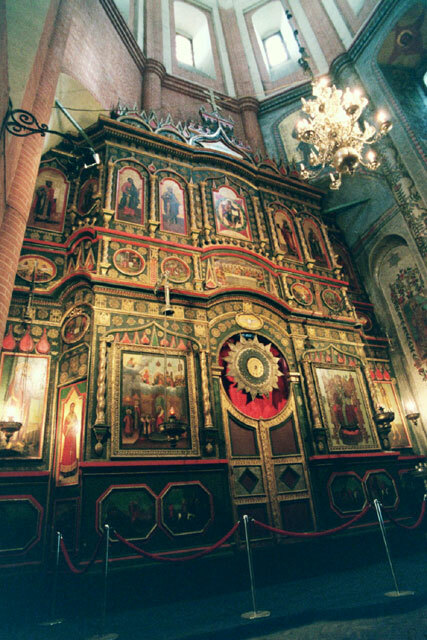 There are something like nine chapels - each of the chapels has their own dome, which gave rise to the unique architecture of the church with its series of onion domes in different shapes, sizes, colors and designs. The interior is quite interesting with the different chapels and snaking corridors, but we did not like the exterior as much. The restoration work seems to be done in a way to make it look as new and modern as possible. We felt that they had done a better job in St. Petersburg, a feeling that extended to the other buildings that had been restored in Moscow. The rest of the afternoon is spent exploring the Kitay Gorod district. 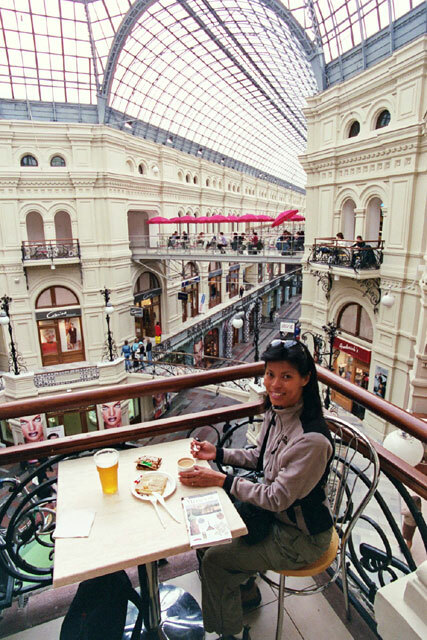 We have a coffee in the famous GUM department store, sitting at a table on the top floor with a small balcony and a view of the glass ceilings and the three arcades or lines. Back out on the streets, we see the Monastery of the Epiphany, with a horrible restoration job. Soon after we pass a security guard making his rounds with a bottle of booze in his hand, from which he takes regular sips. We pass by the Old Merchants' Chambers, which is just about to finish a major renovation - it will rival GUM. Then we explore Ulitsa Varvarka with it's series of older buildings that some how survived over the years. 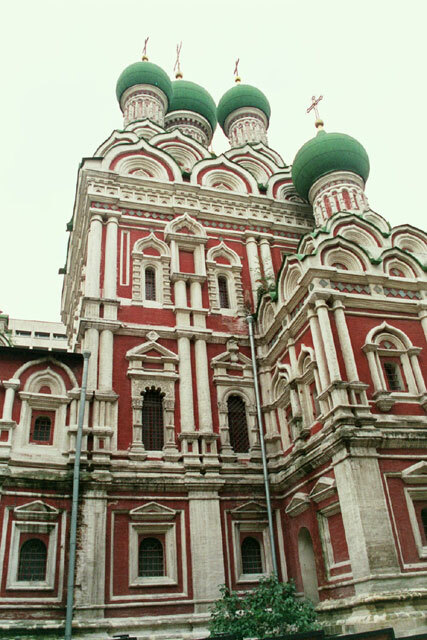 There is the Church of St. Barbara and the Old English Court, given to English traders by Ivan the Terrible in the hope of securing arms and other goods. 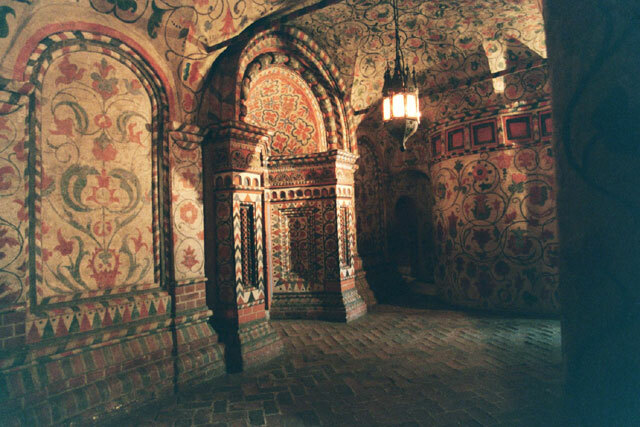 There is also the Monastary of the Sign, the Palace of the Romanov Boyars and the Church of St. George. Standing towering over these old, quaint buildings is the gray, concrete Intourist Hotel that just ruins the whole area. Another Soviet monstrosity. We carry on our wandering a bit further and head up towards Lubyanka Square where the former headquarters of the KGB stands. 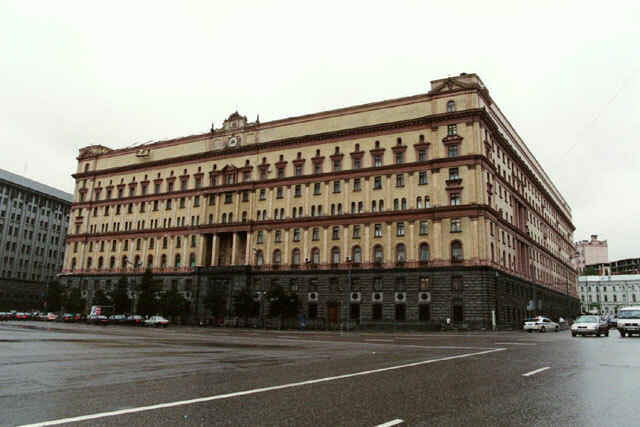 The name Lubyanka was synonymous with terror and the secret police and it would strike fear into the hearts of generations of Soviet citizens. With the large number of people tortured and imprisoned, the building had been expanded on a number of occasions, with the infamous extensive underground prison being added in the 1930's under Stalin. It is now well after 7 PM, so we decide to return to the hotel for a short rest before heading out for dinner. We are not quite sure where we are going to go tonight, so we just wander the streets. In the end, we decide to go for something fast and cheap, but still very Russian. We come upon the Moo Moo place that had been recommended to us by our new Italian friends we met in Suzdal. The line is a bit long, but we decide to queue up and check it out. It turns out to be a great choice in many respects. We are able to see the items on display in front of us, so no problem with menus we cannot read. The food is pretty tasty and it is reasonable. The staff are friendly and helpful. And we get to see Russian marginal cost pricing in action. Before we only saw it on the menus, with each item including its price and weight (often broken down into different components). Now we see it in front of us. Whatever you order is carefully weighed before serving. And this is not to check to make sure you get too little - no, they are making sure that you do not get too much. We would often see them filling up a bowl with some mayonnaise drenched salad, only to take out some bit by bit until the scale gave the correct reading. Oh, yeah - the serves went through this routine of picking up a bowl, placing it on one of the many electronic scales scattered around the place and then zeroing out the reading. Then they would take the bowl and fill it. So, a very enjoyable place to eat. And they also have very good Mors, a cranberry like drink that we discovered in Vladivostok. After dinner we decide to wander the streets a bit and went and checked out Red Square once more. But still blocked off and security is getting even tighter, so even less to look at. Also, the stage for the concert that will soon take place is well under construction. It has started to get cold, so we slowly make our way back to the hotel.